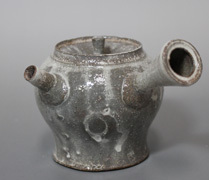 Bankoyaki was established in the mid 1700’s in Obuse in Mie-pref. 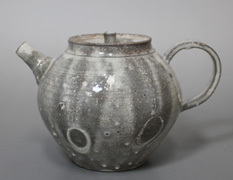 by a powerful merchant, Nunami Rouzan. 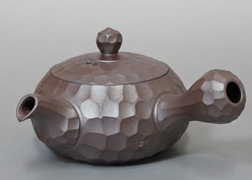 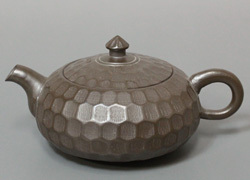 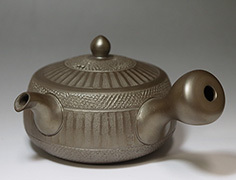 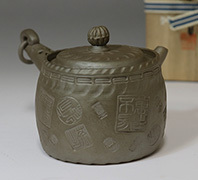 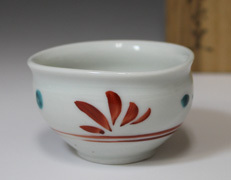 His strong interest in teaware lead to the production of original designs with foreign influences (such as arabesque) and became very popular in Edo. 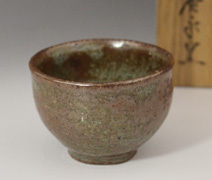 After the death of Rouzan, production ceased until the 1800’s when two talented young brothers Mori Yusetsu and Senchu set up a kiln and started reproducing old Banko ware. 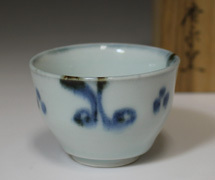 By this time people’s preferences were taking a turn towards delicate and ornate pieces so the Mori brothers made use of new techniques such as wood molding and the use of vitreous enamel to paint moriage (raised) motifs etc. 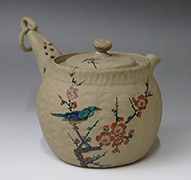 In 1870 Yamanaka Chuzaemon established a kiln in Yokkaichi-city where great numbers of delicate, thin bodied teapots made of white clay were produced for export. 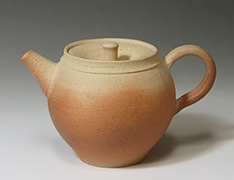 When this white clay became scarce, the remaining clay, rich in iron was used to make teapots on the potter’s wheel. 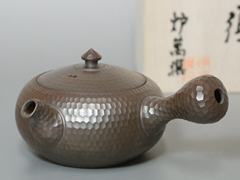 This was how shidei teapots came to be made in Yokkaichi-city, starting a tradition that continues to this day. 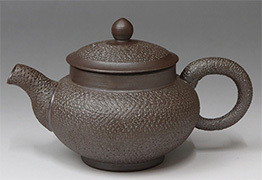 The teapot you receive may differ slightly in appearance to the one shown in the photo. 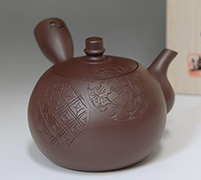 This is because each piece is individually hand crafted. 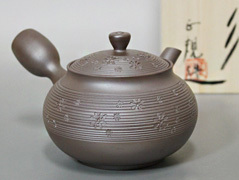 Items with a mark come in a wooden box. 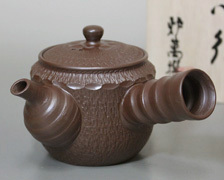 The volume of each teapot is measured at full capacity (ie. 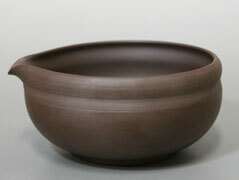 filled right up to the rim, just under the lid). 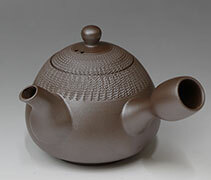 Handeishi is exceptional in that he started his career as an amateur, without the benefit of family connections or an apprenticeship to a craftsman. 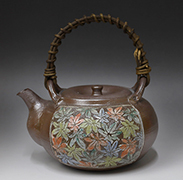 Born in Osaka in 1878 to a wealthy family, the young Handeishi showed an early interest in art. 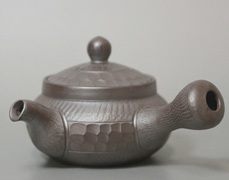 However he chose a different career path, becoming a bank director at the age of 25. 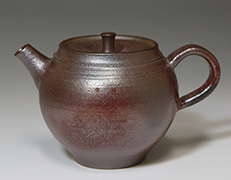 While climbing up the career ladder at the bank, Handeishi pursued his artistic studies, becoming acquainted with major figures in the art world. 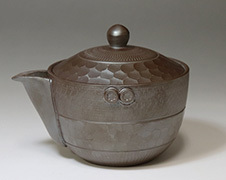 In 1913 he made trips to China and Korea, bringing back various types of clay.He is also reputed to have visited ancient kilns to further his knowledge of traditional techniques and glazing methods. 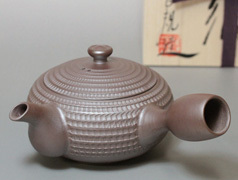 He also devoted a lot of energy to the practicalities, procuring land (Chitose mountain) in the city of Tsu (Mie pref.) 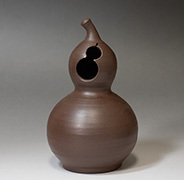 and building his own climbing kiln. 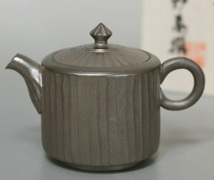 His first successful firing was in 1934. 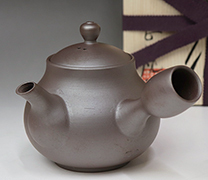 Handeishi retired from the bank in 1942 and in 1946 moved his whole kiln from Chitose to its present location in Hase, setting up the Hironaga kiln and handing down his knowledge to his apprentices. 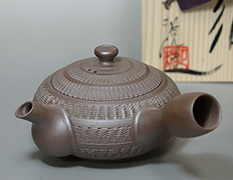 Handeishi's died in 1963 but the Hironaga kiln is still very active , producing a variety of wares using many different techniques. 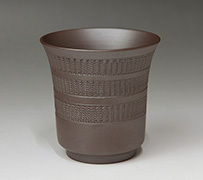 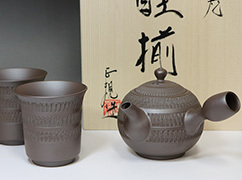 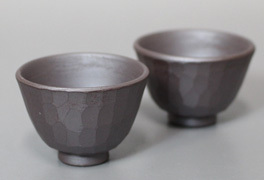 The majority of the pieces are traditional tea ware, created according to old-style methods and trusted techniques. 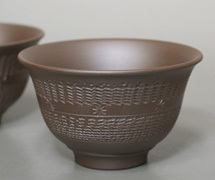 * Some of the pieces featured on this page are not signed. 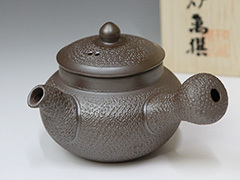 All the pieces regardless of whether or not they have marks, are guaranteed as authentic Hironaga items. 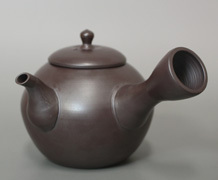 Use Banko teapots just as you would use porcelain teapots. 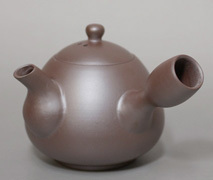 Rinse the inside with hot water after each use in order to eliminate the possibility of tea stains. 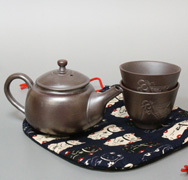 Wipe the outside with a soft cloth and leave to dry naturally, right side up with the lid off. 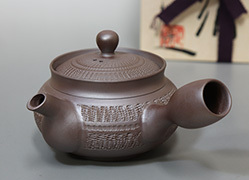 *Never place the pot onto direct fire. 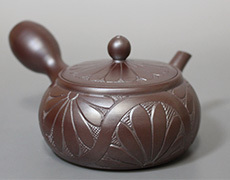 Wiping with a soft, dry cloth gives a lustrous sheen to the pot and makes it even more pleasing to the eye. 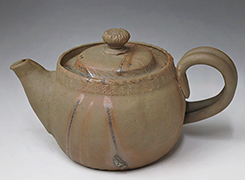 *Do not wipe inside the teapots. 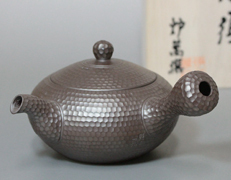 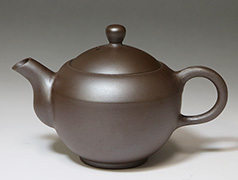 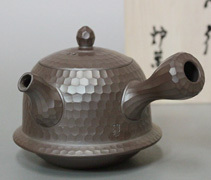 shidei teapots do not require any seasoning, just like most of the Tokoname teapots. 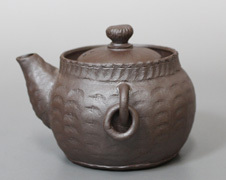 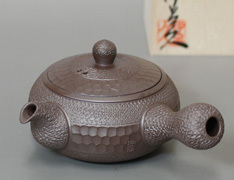 However kata banko teapots do tend to have a clay smell. 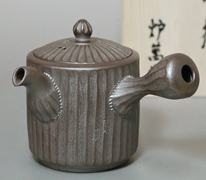 This can be removed by submerging the pot in a mixture of water and used tea leaves. 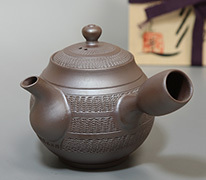 It should take roughly between 1 to 3 days for the smell to disappear.